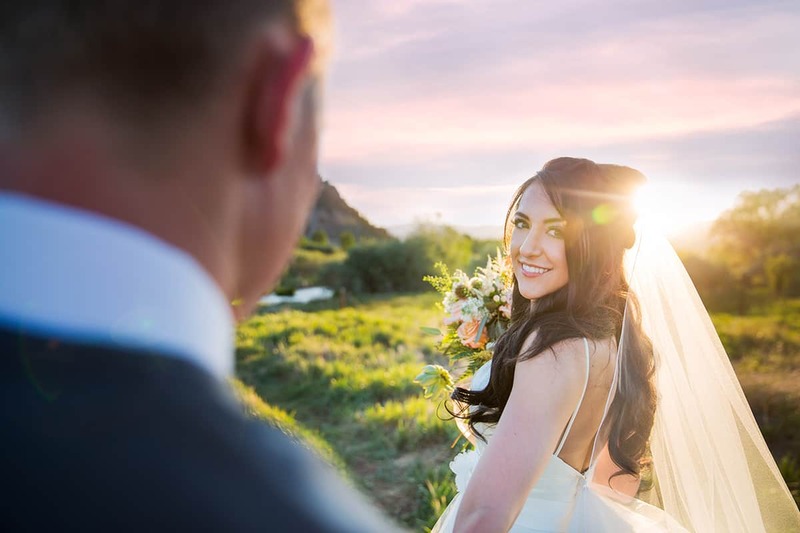 Hayley and Paton’s colorful Colorado wedding took place in their hometown of Eagle. The bright, natural background of the outdoors paired beautifully with a soft palette of peach and sage. A rustic design could be found all throughout the day, including an antler arch for the ceremony, and birch-covered vases on the reception tables. Cameron: Why a Mountain Wedding? 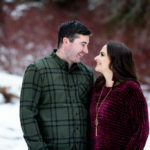 Hayley: My husband and I are both from a small mountain town in the heart of the Rocky Mountains. We wanted to take advantage of the beautiful scenery in such an outdoorsy and breathtaking place! 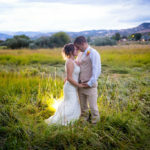 We looked at a few other venues in nearby towns, but we decided to get married in our hometown where we grew up, met each other, and fell in love! Cameron: What are three things you’re glad you did? 1. I am glad we did not spend more money on extravagant things like a fancy venue, or a crazy wedding dress. Some venues and dresses I looked up cost more than our whole budget! We had our reception in the town’s pavilion and did the ceremony on the lawn outside of it. The venue is simple, kid friendly with a park nearby, and convenient. My dress was new but I got it at a bridal consignment store, so I got to feel like a princess without breaking the bank. 2. I loved how we chose to do the food and servers. In high school, I was on the dance team and my aunt is the coach. So we decided to make a donation to the current team to use them as our servers during the cocktail hour and dinner buffet! They were so professional and it was cool to have them there because I know a lot of the girls personally. Their parents helped make all of the appetizers as well—and let me just say, they were unbelievably tasty, creative, and well presented. 3. I am glad we didn’t rent dishware. We found nice plastic utensils and glasses online. We also found recyclable bamboo plates that added to the rustic vibe because they looked like wood. It made the clean up at the end way easier and cut the cost so much. Cameron: What are 3 things you wished you hadn’t done or hadn’t worried about? Hayley: I don’t have a lot of regrets about this amazing day but I just wish I wouldn’t have stressed about details as much, or been as indecisive as I was. The important thing is the actual marriage, not the wedding. How did you find your vendors? Being from a small town, I was fortunate to have a lot of connections and I already knew of most of my vendors. Kacee Picot has been doing my family’s hair for years and is known in the valley for amazing bridal hairdos and makeup. She is awesome! I knew Cameron Ewing and had always loved her photos. She came to me with an amazing idea for our engagement photos (think: ‘mountains, lake, sunset, canoe’!) 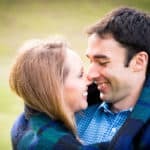 and after she was so easy to work with and took the most amazing engagement pictures of us, I had no hesitation hiring her to take the most important pictures of our lives! Cowboy Catering is a well know business in town as well, and was so accommodating, delicious, and affordable. Everyone was great. Cameron: What’s your biggest piece of advice for other couples planning a mountain wedding? Hayley: My advice for any type of wedding would be to utilize your family and friends! I don’t mean take advantage of them for random chores, but use their strengths to your benefit and ask for their help as a wedding gift. For example, my mom made the boutonnieres, cakes, flower girl baskets and hair pieces, and favors (check out her blog: shessocrafty.net and go to her candle website below)! The cakes were decorated by my bridesmaids. My cousin’s girlfriend, Devon, designed all the flowers and put together the bouquets. She had an idea of what I wanted but is way more creative than me and made it 100x better than I could have ever imagined it. My uncle made the tree cake stands. Paton’s step-dad created our breathtaking arch with antlers he had. My grandma made the margaritas from her own recipe. We had family bartenders. My father/daughter dance song was performed live by my musical sister and was written by my dad. The signs were done by my sister in law. My cousin and Paton’s youth pastor officiated. Family and the wedding party set up and cleaned up. We didn’t need a wedding planner since everyone was so helpful! No brag, but it all turned out so amazing thanks to all these people and many more! Not only did having this help cut our costs a ton, but I think they added way more personal touches. So utilize your people’s skills and do not forget thank you notes afterwards!